Search “New Orleans Snow” on the internet and a blizzard is not the first entry. Instead you’ll find SnoWizard. A company that has brought fine fluffy shaved snow to residents of the Big Easy since 1936. But now it seems, they’re gettin’ snow from the sky Cher!–and it’s making a mess of Mardi Gras. According to the latest Mardi Gras Update, Chaos is cancelled in New Orleans. Babylon and Muses will be postponed to run sometime after Morpheus and at present, no one is manning the ladders on St. Charles Ave. 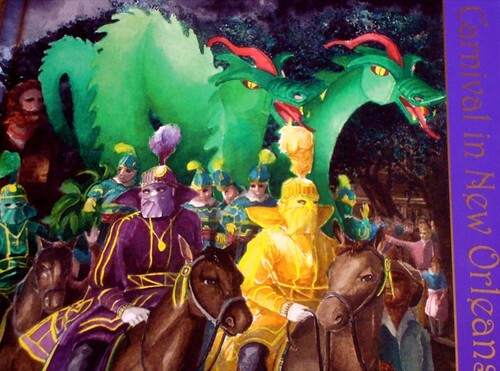 The party in Lousiana started on twelth night and won’t end until the wee hours of Mardi Gras. Remember that the colors of Mardi Gras are telling: purple represents justice, green represents faith and gold represents power. If you can’t make it down to Carnival this season for the real party, try the next best thing, Carnival in New Orleans, A Fantasy. With text and poems by mon pere , Maurice Le Gardeur, illustrations, Mardi Gras etchings and recipes for Gumbo, Shrimp Creole, Red Beans and Rice, Bananas Foster, Oysters Rockefeller and Pralines by Robert Seago and a CD full of New Mardi Gras Classics by John Preble. At $29.95, it’s cheaper than bail, and one can read it next to a roaring fire on a snowy February day without being harrangued by drunken parade goers. This book is a work of fiction probably stimulated by a slice of stilton or a generous shot of brandy in my cafe brulot. Maurice Le Gardeur’s irreverent wit combined with Robert Seago’s elegant Mardi Gras art, make this carnival collection lovely to look at and fun to read. 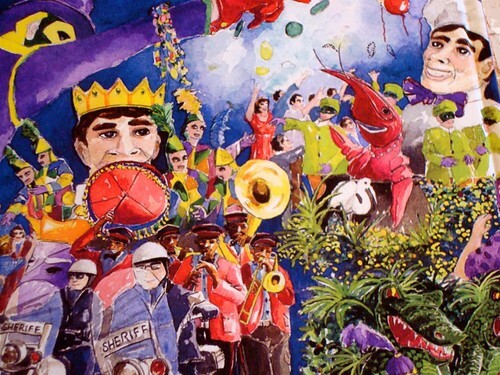 Finally, a Mardi Gras tome that captures the jovial spirit of Carnival in New Orleans! Le Gardeur’s hilarious stream-of-consciousness writing blends with Bob Seago’s lush artwork to create an endlessly re-readable, decidedly local take on the season. The footnotes, ‘toenotes,’ and ‘nailnotes’ are just the icing on this literary king cake. And the included CD of New Mardi Gras Classics transforms it all into an irresistible multi-sensory celebration! Need a copy for your cherie for Valentine’s day? Call the shop at 410-357-9557. This entry was posted in news, reviews on February 12, 2010 by Theaux Le Gardeur.